The 60' Manhattan is known for its luxurious quality and unparalleled performance and combines practicality with sophistication to create a true luxury yachting experience. "We have a number of clients that have been eagerly anticipating our launch into the San Francisco Bay area and we have spent the past several months developing the needed infrastructure to support our successful Fractional Sunseeker Yacht program," said Mike Costa, President, SeaNet Fractional Yachts. Five years ago, SeaNet launched its first yacht in Newport Beach, California. Since that time, the program has rapidly expanded to include ports of call in San Diego, South Florida, New England, throughout Mexico and Costa Rica. "One of the many benefits of joining the SeaNet Fractional Yacht Program is that our members enjoy using these beautiful Sunseeker Yachts in various destinations without the cost of relocating the yachts. I don't know of any other luxury membership program that can offer such a consistent and personal yachting experience across multiple destinations," added Costa. The Sunseeker 60' Manhattan is an ideal choice for the launch of the fractional program in the bay area. With its spacious flybridge and elegant salon seating, SeaNet members will take pleasure in all natural beauty and city sights San Francisco has to offer. "The 60' Manhattan is perfectly suited for entertaining and pulling up to the numerous dockside restaurants the bay area is known for", Costa points out, and "She's also great for those overnight trips to Napa for some wine tasting." To meet current market demands, SeaNet offers one and two year term membership programs that start at $148,450 for a 1/6 share of the 60' Manhattan which includes a full-time Captain and mate, Five-star Concierge services, provisioning, routine maintenance and servicing, slip fees, insurance and documentation. "It's a 5-Star level of service," Costa explained. "No other fractional-fleet operation offers such a high-end level of service." SeaNet, based in Newport Beach, California, has vessels in: Newport Beach, San Diego, San Francisco, Los Angeles, New England, New York, Cabo San Lucas and Ft. Lauderdale. Several yachts travel to Mexico, Bahamas, Costa Rica and future plans for the Mediterranean and Caribbean. 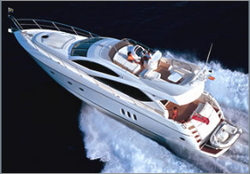 See our listings of fractional yacht programs to compare SeaNet to the other fractional companies.